Mauritz Stiller, the famous Swedish director, arrived in New York with his protegé Garbo in the midst of a heat wave in July, 1925. The reception committee on the pier consisted of only one free lance photographer who had been paid in advance by MGM to take a few publicity shots. They waited in New York for three months on rather limited funds before they got word from Hollywood to take a train to California. Mauritz Stiller was reputed to be a genius and a dominating director. Destitute, he had left his native country of Finland, then a Russian grand duchy, at the age of 21 for Stockholm, where he started to work in the theater. He was already considered the most exciting film director in the country when, in 1923, he tested the almost entirely untried Garbo for the female lead in Gösta Berling‘s Saga, which was based on a novel by Swedish Nobel Prize winner Selma Lagerlöf. Stiller asked the drama school pupil to diet, yet he thought she had potentials. Greta Gustafsson, 17 years old, was signed for the female lead in the nearly four-hour movie for a total of $ 600. The reception was quite good. With Garbo and a film troupe, Stiller travelled to Turkey at the end of 1924 to make a film that was never released. On the way back some members of the troupe stopped off in Berlin where Garbo got a part in the German director G. W. Pabst‘s The Street of Sorrow. 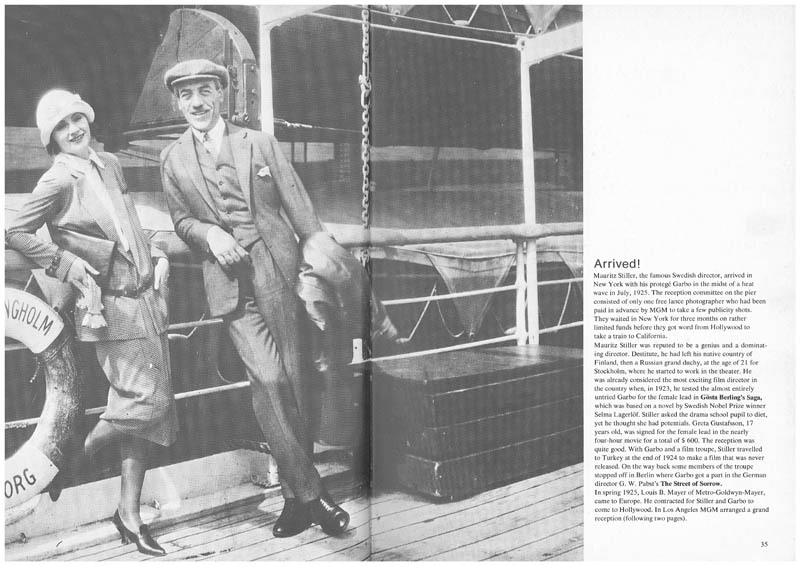 In spring 1925, Louis B. Mayer of Metro-Goldwyn-Mayer, came to Europe. He contracted for Stiller and Garbo to come to Hollywood. In Los Angeles MGM arranged a grand reception (following two pages).